White House Lies: Trump Did Nothing Wrong, Nothing Wrong, Nothing Wrong, Also Nothing Wrong [VIDEO] - Joe.My.God. The White House on Wednesday said President Trump “did nothing wrong” in his dealings with Michael Cohen, pushing back on his onetime lawyer’s claim Trump conspired with him to violate campaign-finance law. He did nothing wrong. There are no charges against him,” White House press secretary Sarah Huckabee Sanders told reporters. She repeated the refrain multiple times when asked about Cohen, who said Trump directed him to arrange hush-money payments to women who say they slept with the president in order to help his 2016 campaign. Sanders declined to answer when asked if Trump is considering a pardon for former Trump campaign chairman Paul Manafort. 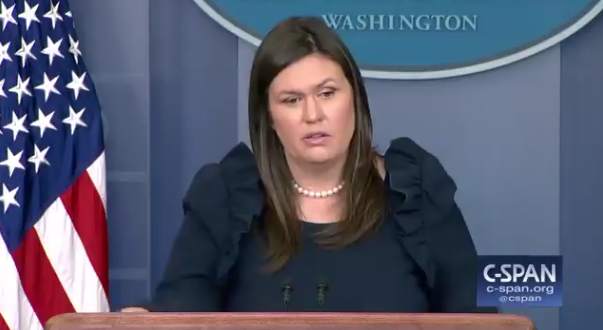 Asked whether the President has lied to the American people, White House press secretary Sarah Sanders said, “I think that’s a ridiculous accusation. The president in this matter has done nothing wrong and there have been no charges filed against him”. The Sarah Huckabee Sanders Propaganda briefing today: He did nothing wrong. Lie. There is no collusion. Lie. Lie. He’s expressed his views. He’s addressed it. Lie. Lie. Lie. Nothing further to add. Lie. Lie. Lie. Lie. Nothing further to add. Lie. Lie. Lie. Lie. Lie. Peter Strzok.